Please excuse me. I did not make much preparation for Chinese New Year*, but I would like to share with you how to make nián gāo (年糕). Nián gāo literally means “year cake,” but a different character for nián (黏) means “sticky,” so you can also call it “sticky cake.” It is traditional for Chinese to make this during the New Year. The cake is very inexpensive and easy to make (preparation time takes only 5-10 minutes). It is chewy, sweet and delicious, especially when warm. 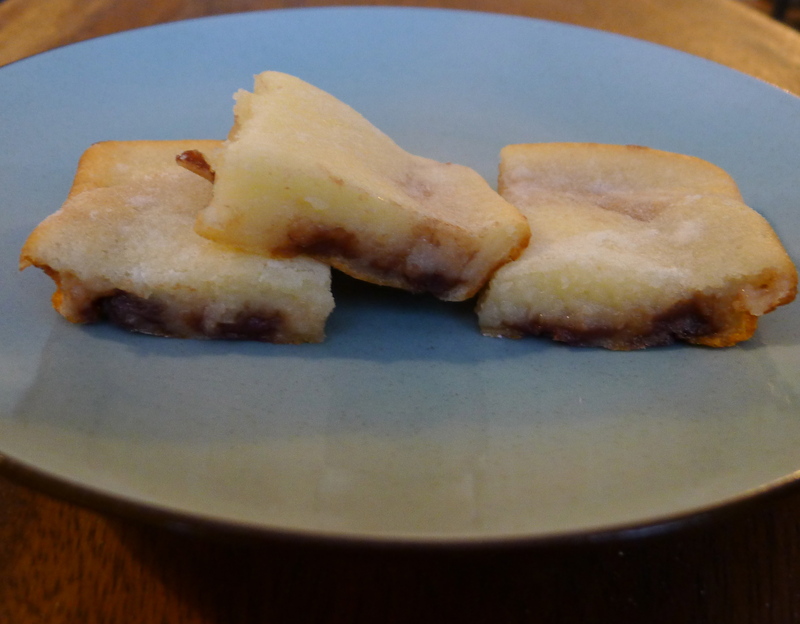 There are many variations of nián gāo, and I like to add red bean paste to mine. (Some people like to add walnuts, dates and other instead). You can pick up the rice flour and bean paste at most Asian grocery stores. The basic cake is made of chewy, sweet rice and is wonderful by itself. The tradition of making this cake also has a story. According to Chinese myth, a week before the end of the year, the Kitchen God returns to heaven to make a report about a family’s behavior to the Yu Huang Da Di (or the Jade Emperor and ruler of heaven). If the report is unfavorable, the family will suffer bad luck the following year. A family makes sticky rice cake as an offering or as bribe to the Kitchen God so that his mouth will be full and satisfied or stuck with the sticky cake so that he will not say bad things about the family. Therefore, eating nián gāo is thought to help ensure a good year. Preheat the oven to 325 degrees. Grease a 9″x13″ baking pan. Pour the flour, oil, milk, sugar and baking soda into a large bowl. Stir flour mixture until even. Add in the beaten eggs and stir again. Now you have your sticky rice cake batter! Pour half of the batter into the baking pan. Next, put the red bean paste into a Ziploc bag or sandwich bag. Cut one corner of the bag (about 1/4-1/2″). Squeeze the bean paste out of the hole into long, horizontal strips, spread evenly apart by about 1″. Pour the rest of the batter into the pan. Place the pan into the oven and bake for about 50 minutes. Once out of the oven, let the cake sit and cool for 10 minutes. After you make this once, you can adjust the amount of sugar and bean paste to your taste, or you can add other ingredients instead. (For nuts, fruits or other, pour the whole batter into the pan. Drop the ingredients evenly 0nto the batter and allow them to sink into the batter.) Some people also prefer to use brown sugar instead of white sugar. Xin nian kuai le (新年快乐)! Happy New Year! *Chinese New Year officially begins on February 10 this year. P.S. If you like your sticky cake a bit heavier, chewier and more evenly layered, please see my post with my sister’s recipe here. This entry was posted in Food, Recipes, Tradition and tagged Chinese New Year, Kitchen God, sticky rice cake by wodezitie. Bookmark the permalink.